Be not afraid of being called unfashionable. Into extreme sports? Suffering temporary insanity? Dodging dish duty? Or simply frugal-minded? Whatever possessed you to head out on the Friday morning after Thanksgiving to be one of the first 50 shoppers to land the two-for-one Elf-on-a-Shelf giveaway, it was surely only your primal will to survive that returned you home Friday evening, safe and sound after a day of elbowing through phubbing teenagers in the Yankee Candles shop and umbrella-yielding Omas in the Piercing Pagoda. Tis the season, eh? Was it worth it? I admit the frenzied excitement that fills the air when the colorful flyers flood the mailbox the Wednesday before Black Friday. Perhaps it evokes memories of the days when the Sunday funnies came in color and you anxiously awaited those. But did you ever stop to ask yourself why? And why aren’t things lasting like they did back in the day? That big TV set that your family had from the time you were allowed to watch cartoons until the time you graduated high school; the microwave oven that was so enormous you could crawl in and hide and also probably gave you and Fido a nearly lethal dose of radiation every time you nuked some popcorn but the dang thing just wouldn’t quit. Things lasted FOREVER – just like Auntie Emm’s indestructible fruit cake. And the reason? Many. But one is discussed in this story from March of this year on NPR’s All Things Considered entitled In Trendy World Of Fast Fashion, Styles Aren’t Made to Last. And that’s kinda sad. And it’s what I thought about on Black Friday here in Austria, when I wasn’t engaging in self-defense leg kicks in the Home Décor department of my local Target trying to hold on to the last Threshold Decorative Stag Head Wall Sculpture (maybe I would have been tempted, had Austria had a Target and the Stag came in a wider variety of colors, like hot pink, for instance). No. I wasn’t there so if you come over to my place looking for Mr. Stag decked out in tinsel you’re bound to be disappointed. Black Friday I was picking up my boots from the shoemaker, Mr. Yildiz, who was explaining to me all the steps he took to put my favorite, very-worn Italian leather boots back into fine beautiful working (walking) condition. Better than new. Who is this hero capable of breathing old leather back to life? Mr. Yildiz came to Austria from Turkey almost 20 years ago. At the time, he hardly spoke a word of German. He started an apprenticeship in an orthopedic shoemaker shop in the 8th district where they made orthopedic inserts for shoes in addition to doing normal repairs. The start was difficult requiring him to take home his instruction booklets at night and translate them word for word to get by. 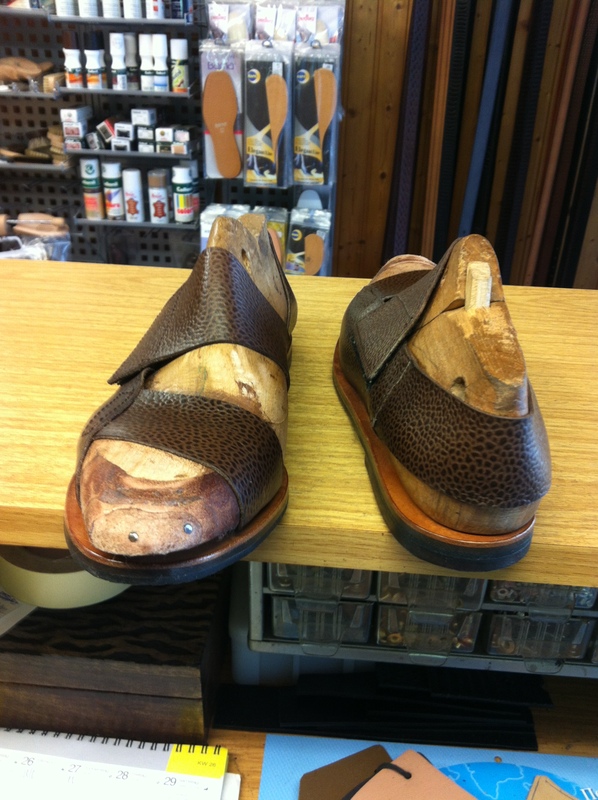 But after a three-year apprenticeship he could call himself a shoemaker and continued working in the shop for over 15 years. When the shop’s owner retired well into his 70s, a family business over a century old came to an end and Mr. Yildiz decided to strike it out on his own. Lucky for me, Mr. Yildiz found himself a shop in the 2nd district and now for over two years, he has been sewing, stretching, patching and polishing life into shoes in his own place since. 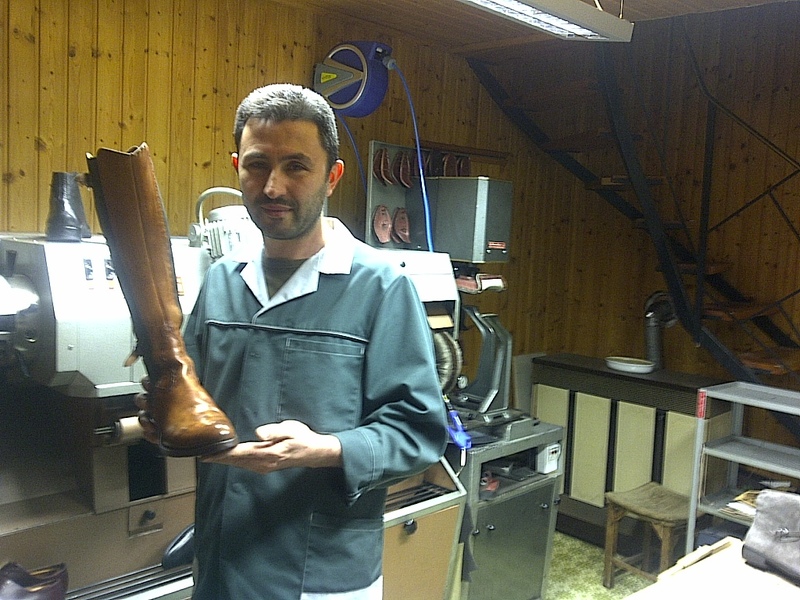 I talked to the expert shoemaker about his skills and the craft and about shoes in general. 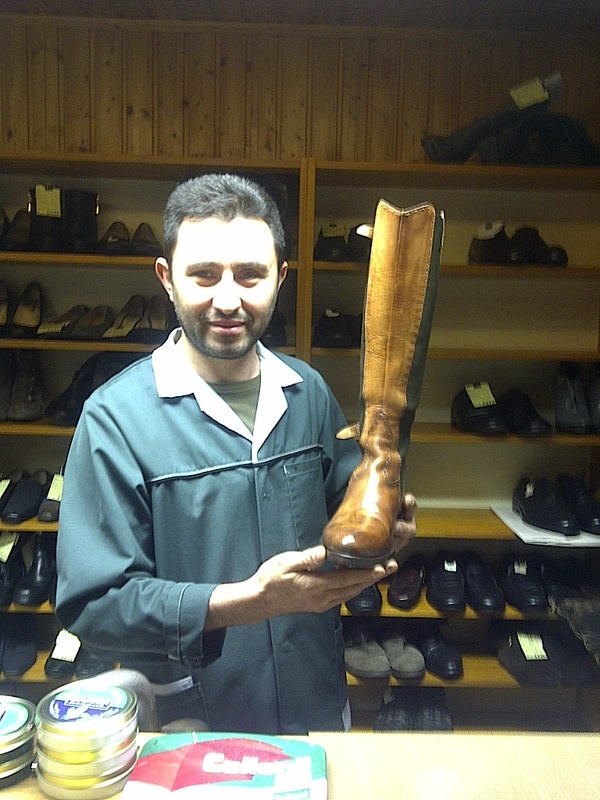 Mr. Yidliz laments that it is often difficult to find a really fine pair of well-made shoes nowadays. Maybe the mass produced shoes are cheaper and more trendy than their hand-made competition but Mr. Yildiz’s doesn’t understand why anyone would want to be constantly replacing their shoes after a month or two. Because let’s face it, nothing fits you as well as an old pair of shoes that have walked with you for weeks, months — if you’re lucky – years. And every time your wee little toe presses the leather on the side and your heel against the back, and your arch against the sole, you are indenting that shoe to fit exactly your foot and no one else’s. 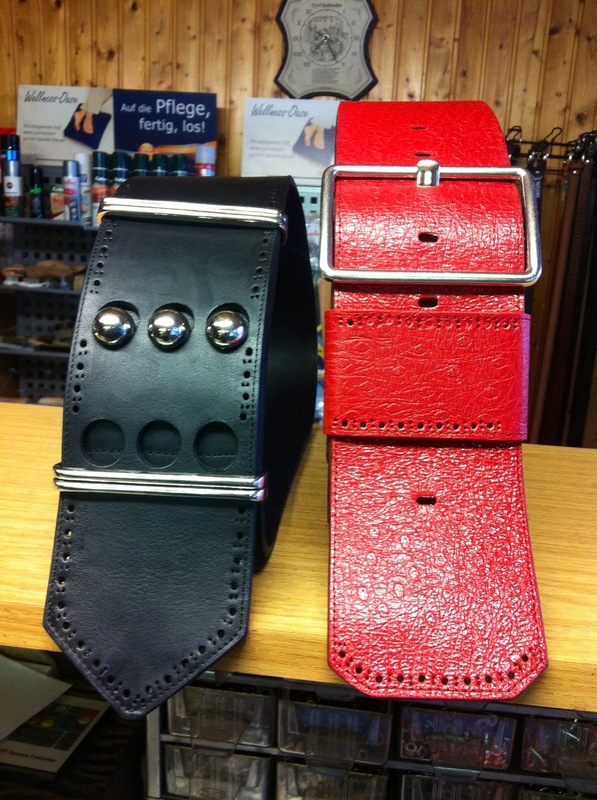 No one else’s shoe and no new shoe will fit you quite like the one you’ve worn. So maybe rather than snatching up the next bargain this holiday season, we should go for less presents but higher quality – giving things that will last. 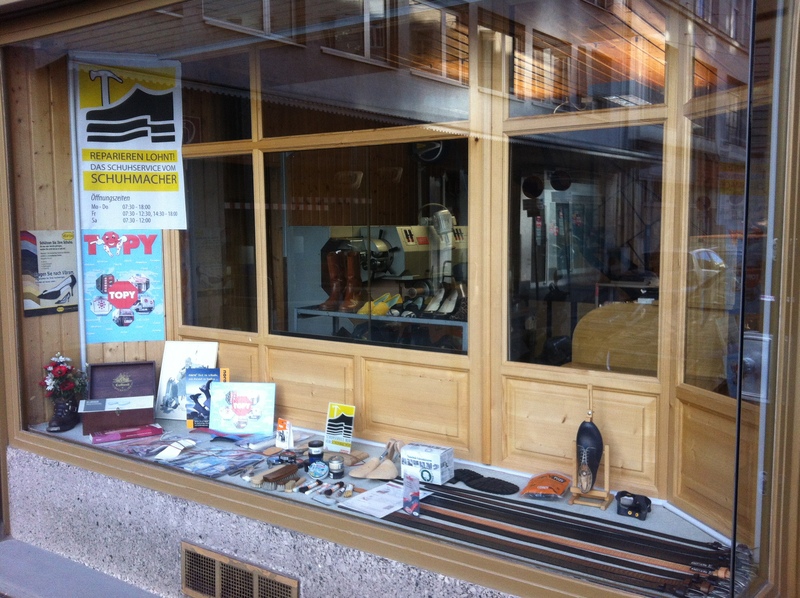 Yildiz Shoe Service, Gredlerstraße 2, 1020 Vienna (just walk over the Marienbrücke bridge from Schwedenplatz or take the no. 2 tram one stop to Marienbrücke).